BY and large, Hindi films stress upon the sanctity of marriage, love and human relationships, reflecting the age-old belief that marriages are made in heaven. However, over the years social customs, mores, traditions and accepted patterns of right or wrong behaviour have undergone many changes. Since cinema reflects society, our film-makers, too, turned their attention to subjects like infidelity. In his magnum opus Andaaz (1949), Mehboob Khan debunked even platonic relations as socially and morally unacceptable. 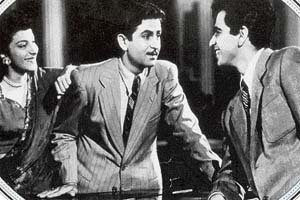 In the film, Dilip Kumar saved the life of Nargis and in return she employed him as a manager. Dilip misinterprets her platonic feelings towards him for love. When Nargis’s husband (Raj Kapoor) suspects that his wife and Dilip Kumar are having an affair, an embittered Nargis shoots Dilip and is jailed for his murder. The climax was a moralistic indictment of the perils of modernity. Does first love ever die was a question raised by B. R. Chopra in his family drama Gumrah (1963). The film portrayed the predicament of Mala Sinha who was forced by her family to marry her older brother-in-law (Ashok Kumar) when her sister died. Trouble brews up when her old flame Sunil Dutt strays into her life. Mala Sinha is overcome with guilt. She realises her folly and a happy ending followed. In Silsila, Amitabh Bachchan gives up his first love, Chandni (Rekha), and marries his dead brother’s betrothed (Jaya Bachchan), who is carrying the latter’s child. The ‘other woman’ raises a storm in the family. Chopra resolved the conflict between the rights of a woman as a wife and the claims of a woman as a beloved by giving an upper hand to the wife. In Basu Chatterjee’s Swami, Shabana Azmi, though married, invites her former lover Vikram to her house. However, she manages to overcome her infatuation slowly. Mahesh Bhatt’s Arth was an unusually sensitive film on infidelity and domestic violence. Here Pooja (Shabana Azmi) walks out from a soured marriage on learning that her husband, a film-maker (Kulbhushan Kharbanda), is involved with an actress (Smita Patil). She shows thereby that a woman holds her self-esteem above everything else. Guilt-ridden, Smita succumbs to schizophrenia and leaves Kharbanda to rue the complications that are of his own making. In Gulzar’s Ijazat, Naseeruddin Shah loves a whimsical girl, Anuradha Patel, but marries the stable and tranquil Rekha. He wants to have his cake and eat it too and like most men in a similar situation does nothing but look on helplessly until Anuradha is killed in an accident and Rekha marries another man (Shashi Kapoor). The film gave the message that an unfaithful partner often falls between two stools. In B. R. Chopra’s Pati Patni Aur Woh, Sanjeev Kumar plays the husband with a roving eye for pretty secretaries and is not above telling lies about his "paraplegic" wife. By the end of the film, he pays dearly for his philandering behaviour. In Shekhar Kapoor’s Masoom, the domestic bliss of a wife, Shabana Azmi, is clouded by the arrival of a child, Jugal Hansraj, who is her husband’s (Naseeruddin Shah) illegitimate son. Shah had a fling with a terminally ill woman (Supriya Pathak). It was a tough task for the erring husband to convince a recalcitrant and hurt wife to forgive him and accept his son. It is not only the man who strays from the code, sometimes even a woman slips, compelled by circumstances. In Agnisakshi, Madhu (Manisha Koirala) assumes that her tyrannical and hotheaded husband Vishvanath (Nana Patekar) has died in a car accident. She leaves Mauritius for Mumbai and marries Suraj (Jackie Shroff) without revealing to him her past. Her newfound happiness is short lived as Vishvanath follows her to Mumbai and claims her back from her second husband. In Mahesh Manjrekar’s Astitva, the predicaments of Aditi (Tabu) are explored painstakingly. Her husband discovers after 20 years of their marriage that his wife had a sexual relationship with a tutor in his absence. This led to the birth of an offspring whom the husband believed to be his own. Protesting over the way she had been humiliated for a "one-time" omission, Tabu left home and acquired an identity of her own beyond that of just being a daughter, mother and a wife. Dev Anand’s Guide explored a woman’s choices when confined to an unhappy marriage. The story revolved around a beautiful girl Rosie (Waheeda Rehman) whose mother, a dancer-courtesan, forced her into an unhappy but ‘decent’ marriage with a dry and crabby archaeologist (Kishore Sahu) to save her from a fate similar to her own. When Rosie meets a charming guide Raju (Dev Anand), she leaves her nagging husband and starts living with the former. Once standing in a cave she cries out, "Marco, main jeena chahati hoon". She voices the anguish of suppressed women languishing in bad marriages. Basu Bhattacharya’s Aastha highlighted how consumerism can affect moral values. In this film, the lady of the house Rekha sells her body to augment her principled husband’s (Om Puri) inadequate income. In Raj Kanwar’s Judaai, the materialistic wife (Sridevi) coaxes hubby Anil Kapoor into marrying Urmila Matondkar for money. In Anuraj Basu’s Murder, sizzling Mallika Sherawat is seduced by her former lover Emraan Hashmi in Bangkok where her indifferent husband is lost in the thoughts of his last wife who is her elder sister. By the time remorse surfaces, it is too late and a murder has been committed. Bewildered and alarmed at the way marriages in modern society are breaking up, the young film-maker Karan Johar in Kabhi Alvida Naa Kehna offers fresh insights into problems of straying couples. Instead of crafting a morally and socially acceptable solution, the film suggests that if things are not working out smoothly and a couple wants to move away from each other, it is better if they do so with dignity.